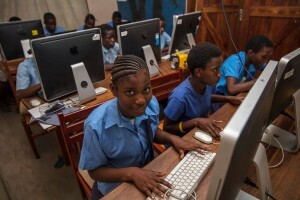 Many students in Zambia are unable to take IT lessons, let alone pass an IT exam, which is part of the Zambian curriculum. They simply don’t have the resources. Condell Park Public School in Australia got in touch last year as they were replacing 20 of their old Apple computers and could they be made use of by someone else? The answer was of course, yes! They would be so useful and could really make a difference. Then comes the added problem of getting them from one continent to another! Fortunately one of the teachers has a contact at a shipping company, who very kindly offered to send the computers all the way to Zambia. Without this help, the idea would have fallen at the first hurdle. It took time and effort, mostly on the part of the school who spent hours packing boxes and filling out paperwork. The computers finally arrived in Zambia several weeks later. The final piece in the puzzle was to get them released by customs and to their new home. The Bushcamp Company facilitated this last step, arranged collection and managed their distribution. The computers are now being used by a local school, both for lessons and an after school photography club – fantastic news!